Rockland Immunochemicals Inc. has partnered with the Wistar Research Institute, to produce and validate a diverse panel of low passage melanoma cell lines from freshly excised metastases. More than 100 melanoma cell lines are grouped for BRAF, N-RAS, KIT, PTEN and CDK4 mutations. These pre-clinical tumour cell lines models can be used to identify the critical target genes and pathways enacted by genomic alterations and lead to more accurately prediction of the effectiveness of novel cancer therapeutics and facilitate cancer research. Historically, a number of tumour model systems have lacked scientific value due to the limited characterization of genetic drivers, gene and protein expression, and in vitro/in vivo data. 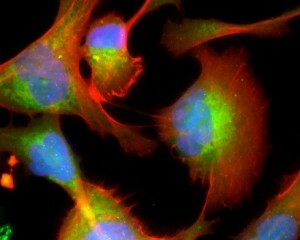 With these human melanoma cell lines, in vitro and in vivo modeling is brought into practice. The benefit of these established cell lines is that they were derived from patients’ tumours and thus represent the natural heterogeneity of this disease. These primary melanoma cell lines were derived directly from human melanoma tissue and resemble the tumour with all its heterogeneity and encompass detailed pathology, and clinical staging data of the patient. These models are biologically stable in terms of gene expression pattern, tumour architecture, and mutation status that allows for therapeutic targeting of known signaling pathways. Multiple cell lines for each mutational subgroup allow for biological replicates within experiments, and primary and metastatic pairs allow for melanoma progression studies. These cell lines are validated by Short Tandem Repeats (STR) profiling, and by microarray gene expression analysis. These melanoma cell lines can metastasize to most organs of an immunodeficient animal (for example NOD/SCID mice). Development of a melanoma cellular line (Rockland Immunochemicals – tebu-bio). After a low number of cell passages, cells are banked and validated by extensive analysis including copy number determination, gene expression profiling, immunohistochemical staining with antibodies to known tumour biomarkers, STR and response to drugs. These models have the ability to predict clinical activity as they are biologically stable in terms of gene expression pattern, tumour architecture and mutation status. These melanoma cell lines serve as individualized experimental models, important for drug treatment and outcome. This collection, originally provided by Dr. Meenhard Herlyn of The Wistar Institute, has been characterized to confirm a match to that of the originating patient tumour tissue via mRNA, qPCR and DNA short tandem repeat (STR) analysis. A summary table indicates the disease stage, gene mutations, pathology and relevant clinical data for each of these human melanoma cell lines. The key application of these cell lines include genetic studies, xenograft production, and drug testing and drug target discovery. In addition to viable cells, non-viable cells for lysate production, genomic DNA, and total RNA from each melanoma cell line are also available. 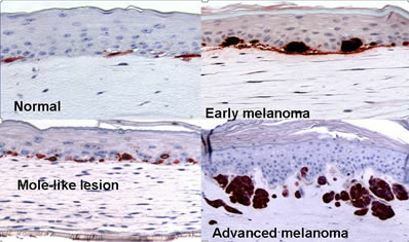 Malignant melanoma is associated with genetic heterogeneity and a complex etiology. In contrast to other skin cancers, melanoma has a strong tendency to metastasize with a consequently extremely poor overall prognosis for survival. The various phenotypes of melanoma are characterized by clinical features, such as bodily distribution or risk factors. Cutaneous, uveal, acral, and mucosal melanomas have divergent clinical courses and are associated with distinct mutations, and risk factors. In the majority of melanomas, a number of genes and signaling pathways are involved in cellular proliferation and growth, and have been implicated in the pathophysiology of melanoma. The melanoma microenvironment. Image courtesy of Dr. Meenard Herlyn, Wistar Institute, Philadelphia, PA. The collection of melanoma cell lines is organized based on the presence and/or absence of mutated or wild type genes. At a minimum, these cell lines have been characterized for the following genes: BRAF, N-RAS, KIT, PTEN and CDK4. Download your overview of the Melanoma Cell Line specifications here. Research data reproducibility is dependent on high quality reagents for discovery, including melanoma cell lines. Each cell line developed is thoroughly tested for gene expression pattern, tumour architecture and mutation status. Cell lines are also tested for sterility, mycoplasma, mRNA, qPCR and DNA short tandem repeat (STR) analysis. 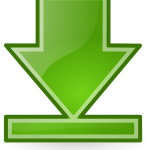 Download your copy of the Melanoma Cell Line Cell Culture Protocol here. Any questions or comments? Would these products be of use to you in your research? Feel free to use the form below to get in touch.